We know: You’re having a bit of a rough morning after the New Year’s festivities, and aren’t quite up for the rigours of the day. Don’t worry, we’ve got this covered. Forget about depressing news or complicated concepts, and enjoy this tree full of wild cats. This pack of bobcats were hanging out in a mesquite tree in Texas as mom taught her juvenile cubs the tricks of the trade for being a big cat in the wild. Were they using their excellent field of view to hunt rodents, or just taking a break? Either way, it’s a fantastic view of these beautiful predators. Bobcats are about twice the size as average housecats, with long legs, oversized paws, and tufted ears. Their tails are naturally bobbed, shorter than the evocative whips of their cousins. Mama bobcats usually have between two and four kittens in a litter, and train them throughout the spring into the summer. They’re grown up and ready to hunt on their own by autumn. 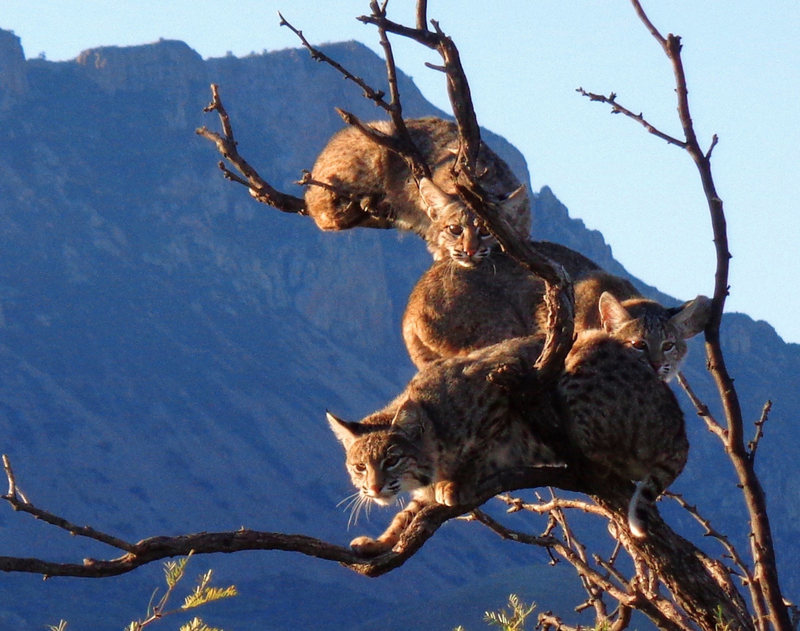 Top image: Bobcats in Big Bend National Park, Texas. Credit: Big Bend Natural History Association.